Partido Manggagawa (PM): Workers of Korean-owned companies with labor disputes ask: Can APEC protect labor rights? Workers of Korean-owned companies with labor disputes ask: Can APEC protect labor rights? Workers from two Korean-owned companies based in the country who are now embroiled in labor disputes are asking the leaders of the countries attending the Asia Pacific Economic Cooperation (APEC) summit if its agenda includes protection for labor rights. 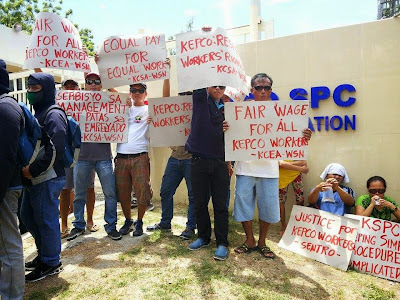 Employees of power company KEPCO-Cebu and metal factory Tae Sung in Cavite have charged their managements with union busting and have pending labor disputes. The labor group Partido Manggagawa (PM) slammed APEC for “double-speak” as repression of workers’ rights belies its “inclusive growth tagline.” “Inclusive growth in APEC countries is impossible without respect for basic labor rights, including the right to unionize and receive living wages.” insisted Rene Magtubo, PM national chair.